On September 25, 2004, Ultima Online celebrated its 7th year of operation. The date occasioned a box release that contained the following: Ultima Online, Ultima Online: The Second Age, Ultima Online: Renaissance, Ultima Online: Third Dawn, Ultima Online: Lord Blackthorn's Revenge and Ultima Online: Age of Shadows. Players also received one of seven anniversary gifts, a collector's edition of the Ultima Online Fan Guide, which included exclusive art from the history of Ultima Online and interviews with the development team and community leaders, and a full version of the classic Ultima IX: Ascension. Ultima 9 was the last game in the single-player Ultima series. 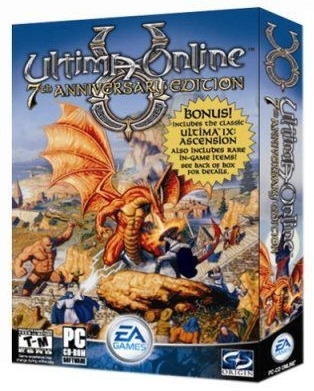 Known alternately as: Ultima Online: Seventh Anniversary Edition and Ultima Online: The Seventh Age. The 7th Anniversary Gifts can still be had via Heritage Tokens. This page was last modified on 26 April 2008.